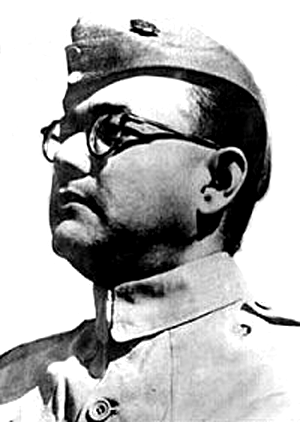 On this day one hundred and sixteen years back in 1897 Subhash Bose, lovingly called Netaji by his country men, was born in Cuttack, Orissa. His father, Janaki Bose, was a leading lawyer. Daredevil from his childhood, while in class VI, he had joined a group of social workers to serve cholera patients in the city. That was a time, even today, when there used to be an atmosphere of fear by the very news of cholera. This brave boy was a brilliant student, studied at Ravenshaw Collegiate School in Cuttack. He had qualified in coveted ICS exam held in England, but tore off the certificate before reaching the Bombay harbour so as to take part in India's freedom struggle. He was Congress President in 1938. Though Netaji differed from Gandhi ji's peaceful movement, both had great respect for each other. This fierce patriot founded Azad Hind Fouz (Indian National Army) and fought against British from Burma border. Vende Mataram, Delhi door nahin (Delhi is not far), Delhi chalo (March to Delhi) and Jai Hind are his immortal slogans. Even today these slogans set heightened heartbeats in any Indian. On this sacred day we, the Indians, salute you, Oh great son of our nation. I take special pride to remember him for, first I am a native of the same city Cuttack, and second, I studied in the same school! The waves of patriotism that you have set in the hearts of your country men shall have no ebbs !!! Long live Netaji. Thank you, Dinesh. Considering the leaders these days, Netaji appears to be from some other planet. Let us emulate this fierce patriot. I join to salute Netaji.